4. Neonatal Hypoglycemia: Is There a Sweet Spot? 5. Big Data in Neonatal Healthcare: Big Reach, Big Reward? 8. Modes of Neonatal Ventilation: Breathe Deeply! With collaboration from Consulting Editor, Dr. Jan Foster, Dr. Beth Diehl has created a current issue that updates the topic of neonatal nursing. 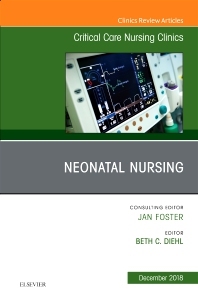 Expert authors have contributed clinical reviews that address the following topics: Family Centered Care and Multidisciplinary Rounding in the NICU; Standardized Feeding Protocols and NEC; Preventing Hypoglycemia: Finding the Sweet Spot; The EMR and Big Data in Neonatology; Fetal Surgery and Delayed Cord Clamping: Neonatal Implications; Neonatal Encephalopathy: Current Management and Future Trends; Modes of Neonatal Ventilation; Neonatal Resuscitation: NRP 7th Edition Practice Integration; Neonatal Pain: Perceptions and Current Practice; Neuroprotective Developmental Care for the Preterm Infant in the first 72 Hours of Life; NAS: An Uncontrollable Epidemic; and Neonatal Transport: Current Trends and Practices. Readers will come away with the current clinical information they need to improve patient outcomes in the NICU.